I think color can be used at any time of the year even though there are traditional colors for every holiday. I used traditional Christmas colors to create this weeks card and it is just as endearing as it could be in any color combination, or at least that is what I think. I used the Atlantic Hearts challenge Sketch for a jumping off point. The image comes from All That Scraps and she is just button cute! I used Derwent Inktense to watercolor the image. I am really looking forwRd to someday trying out the Distress Markers and color a few images with them! I did not intend the colors to be "Christmas" when I began but just started coloring and went with what was around. 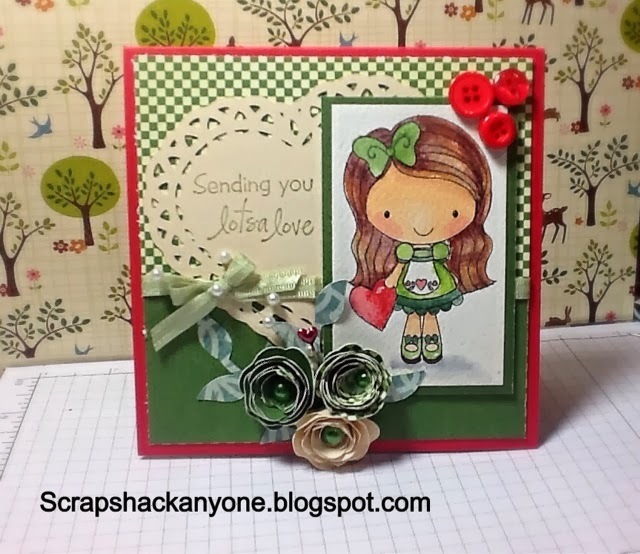 I did use Crate Paper for the base green and patterned paper. I used Artiste CTMH cricut cartridge to create the rosettes and the die cut hear doily and the center pearls from Bo Bunny. The red buttons are from Echo Park and they are from a Christmas Line, but they fit the design so I used them. I used Making Memories sage green ribbon from my stash and voila! Another Valentines Card is almost complete! For the first time I used Amy R sentiments from the rubber stamps and I have to gush! I would not only recommend them but HIGHLY recommend them. It is great to have a stamp be perfectly clear and ready to go the minute you get them cut out. I have to give a loud shout out to All That Scraps also known as C.C. designs! Great product!